Batsheva Hay is the New York designer single-handedly making modesty cool again. It all started when her husband, celebrated fashion photographer Alexei Hay, converted to Orthodox Judaism shortly after they married. Although Hay decided not to follow suit to his religious leanings, it still presented her with a challenge – how would she maintain modesty and avoid offending the Rabbi while remaining stylish for Shabbat services? Hay found her solution in the high collars and 80s pastoral silhouettes of Laura Ashley dresses, sourcing them from secondhand and vintage stores. She began working with patternmakers to alter the dresses, making the sleeves puffier, the waistline higher, and using assorted vintage textiles to create brand new pieces that maintained the prairie sensibility. 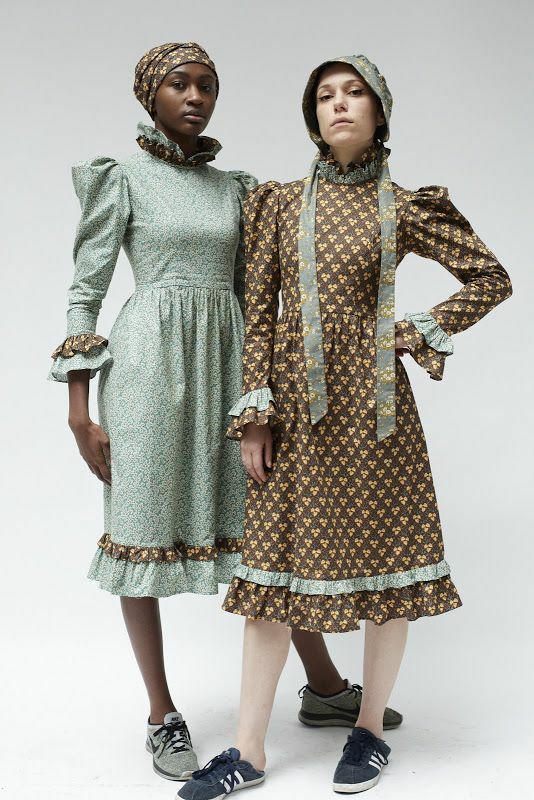 These homesteader dresses, juxtaposed with modern styling and fabrications including metallics and denims, play with the lines between Pre-Raphaelite fantasy and Americana workwear. As soon as Hay began posting photos of her pieces on Instagram, the fashion world took notice. Since then, everyone’s been batshit for Batsheva. Batsheva catapulted to the spotlight as a finalist in the CFDA Vogue Fashion Fund competition, judged by the likes of Anna Wintour and Diane von Furstenberg. Her line has developed a cult following, frequently worn by Natalie Portman, Amandla Stenberg, and Erykah Badu. At first glance, these women may appear to be characters out of Little House on the Prairie roaming the New York City subway. Now many have come to know of Batsheva through her off-kilter fashion presentations. For Hay’s Spring 2019 presentation, she staged a show in a New York City diner, complete with milkshakes, french fries, and models styled with 1950’s beehive hairstyles and cat-eye glasses. Batsheva’s Fall 2019 presentation embraced the kinderwhore aesthetic with children’s doll prints and a live violinist playing Hole songs. Courtney Love herself paraded down the stairs as the finale of the show, performing as an unhinged bride belting out “Miss World”. Batsheva has also collaborated with Brother Vellies, bringing CD-ROM, clear latex, dollar bill, and python prairie dresses to the masses. Fashion theorists suggest that fashion moves in cycles, from maximalism to minimalism, revealing to modest. As our hemlines change their length, they serve as an indicator of our cultural and economic zeitgeist. In our current fast-paced and ever-changing digital and political landscape, no designer exemplifies this world of extremes better than Batsheva Hay, New York’s designer du jour. Ink Magazine features Batsheva in the fashion editorial “Kitsch Stitch”, which can be found in Ink’s Spring 2019 Print issue.